On this night—the final night—a fog swirled across the desert, as thick and impenetrable as a sandstorm. It made mysteries of the stars, and spies moved across the dunes in darkness. They searched from camp to camp in the strange air, looking for something special. From across the vast and parched Arabian Peninsula, camels converge on Abu Dhabi for an annual beauty contest. Here the traditional beast of burden becomes a pampered show animal. The quest hadn't started this way, with espionage in the dark. For a month before this January night, Bedouin caravans had trekked great distances across the Arabian Peninsula, from Oman, Saudi Arabia, Qatar, and elsewhere. They had come to a remote spot in the Abu Dhabi emirate to take part in the show: a beauty pageant for camels. For nine days the animals paraded before a grandstand—camels of all sorts, the most prestigious being groupings of 35 females—and imperious judges waved away the homelier groups with their dejected owners. As the days passed, the judges rewarded certain standards with dispatch, winnowing a field of some 24,000 contestants. By the tenth day just two Bedouin men remained with their resplendent beasts. The men—who as elder heads of their families went by family names, Bin Tanaf and Rames—would face each other in a meeting fraught with intrigue and rivalry, since they were cousins from the same tribe. For years they had jostled for position and prestige at smaller contests, and the result now would decide each man's place not only in the world of camels but also within his very tribe. The winner stood to leave with extravagant prizes, yes, but more important, with family honor. So each sent spies. Beauty spies, who scoured the camps for the one especially gorgeous camel that—once purchased—might give him an edge when the sun rose and judgment began. Consider, for a moment, the camel. Note the great hump, the lolling mound of fat that sways with each step of the skinny legs. The knock-knees and flat feet less happy at a run than a galumph. See the neck, too, drooping as if under the weight of the head. And then the head itself: the absurd eyelashes fluttering above oblong nostrils and rubbery lips, from which dribbles a stream of thick, white cud. This is not a creature of surpassing beauty, surely; this is a creature of spare parts. But the judges in Abu Dhabi view camels with different eyes, scrutinizing them from nose to tail and back again, evaluating each according to strict criteria. Her ears must be firm. Her back high, her hump large and symmetrical. A rump that's not too big, with just enough room for a saddle. The hair, of course, must shine. A good head is massive. Her nose should have a strong arch in the bridge, sloping toward a bottom lip that hangs down like a bauble. A long neck appeals. As do long legs. And the judges examine the two toes of the feet, looking for what their guidelines call "toe-parting length." Because so many beauty pageants, in the end, do come down to cleavage. Bin Tanaf, a small man with a game leg and a tidy black beard that belies his advancing years, sat on a dune overlooking his camels and reflected on nomadic life. He grew up traveling with his family from one oasis to another in a perpetual search for pasture and water. 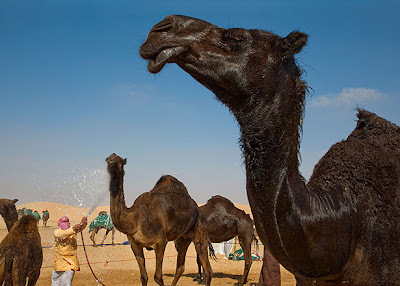 In summer the camels could go five days without water and in winter many weeks. "With them, we survived," he said, lifting his chin toward his camels. This relationship, this love between nomad and camel, began thousands of years ago in the heart of the Arabian Peninsula. Camels, first and foremost, provided transport across the desert. They were also mounts for raiding rival tribes, to claim or reclaim other camels. During the first half of Bin Tanaf's life his family's camels produced milk for drinking and hair for weaving into blankets and tents. Dung for fueling fires. Urine, even, for a hair wash, to keep lice away. Since Bedouin life centered on movement, land held no value for them; instead, camels became the measure of a man's wealth. And so, a whole vocabulary of distinctions arose to describe them. Asayel are the noble red camels. Majahim are dark. A female baby camel is a houraa, a new mother a bikr. A male at puberty is a fahl, and a female is jathaa, unless the male has been with her recently and her udder has begun to swell, in which case she is a laqha. No stage in a camel's life, no moment of growth or excitation, escaped attention. The two species, man and camel, suffered and exulted as one. Then, Bin Tanaf said, something changed. After thousands of years of sameness, life altered in radical ways. The British left in 1971, ceding control of an oil gush that rained down on the Bedouin. The tribal emirs banded together to form the United Arab Emirates with Abu Dhabi as their capital, and money—a great rolling wave of money—flooded the desert. Bin Tanaf entered the automobile business. Oil-rich residents bought cars at a furious clip, and he shipped them from overseas makers to the emirates, Saudi Arabia, Kuwait. His compatriots made their fortunes in construction or shipping or in oil itself. They had grown up not just poor but with no conception of poor, and now the morning sun could hardly climb over their mountains of money. Unable themselves to read or write, they sent their sons to study English in London and French in Paris. They migrated one last time, from camel-hair tents to glass skyscrapers in Abu Dhabi and Dubai. Throughout much of the peninsula the nomad came to embody two conflicting ideas. At first city dwellers—themselves hardly removed from the desert—regarded the occasional sand-dusted Bedouin visitor as a rural curiosity, a bumpkin who carried his possessions in a sack. But that image is now giving way to something more romantic: the nomad as the quintessential Arab, a symbol of freedom. The Arab who gives no thought to oil, but merely to food and water for his camels as he rides into the sunset. Rube or hero, he unavoidably resembles the American cowboy. And just as well-to-do Americans breed, race, and show their horses, so do Bedouin with their camels. The Arabian gentleman, like the American, spends his weekends at his stables. He examines his animals, feeds them special food, showers them with affection. He barks at them, then sings a song of forgiveness. He loves them. And he prepares, all the time, for fierce competition. The contest arena itself embodied the nomadic lifestyle, taken to its most luxurious degree. The Bedouin erected a multistory grandstand, banked with plush chairs and lined with big-screen televisions that featured live footage of the contest below, all in a tent. Serving boys ran about with tea and tins of burning incense that the men waved into the folds of their ghutras, or headdresses. Outside, the helipad awaited the arrival of sheikhs and princes. The women spent each day shopping at a nearby suq, a market the size of a small town, built especially for the event. Bedouin camps dotted the landscape around the site, and with each dawn, participants would walk their camels to the arena. Row upon row of luxury sport-utility vehicles—more than 140 Range Rovers, Nissans, Toyotas, all prizes for various winners—framed the staging area. The judges awarded secondary prizes to single camels, to very young camels, even to male camels. On the climactic day of the greatest contest—the caravan-size parade of females—Bin Tanaf and his cousin Rames looked over their camels. Their spies had chosen well in the night. By sunrise Rames had secretly spent two million dollars on several remarkably fetching camels. Bin Tanaf had spent more than a million on just one. Now the men moved unhurriedly, even as the sun rose into the sky. Their culture, rooted in the nomad's need for perpetual motion, values the relative luxury of stillness and calm. To be waited upon indicates rank and status. So each man wanted to show up last at the arena, to make his appearance with a peacock-like display of poky grandeur. One of the contest organizers arrived at Rames's camp to nudge him into action. "Rames, I worry that the judges will close the gate." Rames gazed about serenely. He carries himself with the stature of a king. "Do not worry," he said. "They will not close the gate." Some distance away Bin Tanaf paced among his camels, awaiting word that Rames had left his stables. Bin Tanaf is the sheikh of his tribe, which gives him a position of authority, even over Rames. But in recent years Rames had cultivated a friendship with Crown Prince Mohammed bin Zayed Al Nahyan—who, as it happened, was the festival's patron—giving Rames an advantage, perhaps, in affairs of both camel and family. Bin Tanaf waited. Then his cousin started moving toward the arena. Bin Tanaf signaled for his camels to move as well. Gradually he drew near the arena, and—horror! The upstart Rames had draped his camels in blinding silver capes, like a whole company of opera singers heaving in from stage left. Rames had spent $20,000 a month on special camel food, and it showed. At the gate his caretakers whipped off the camels' capes to display their enchanting necks and undeniably symmetrical humps. The two groups of animals paraded before the crowd. Then the two men took seats of honor in the grandstands to await the judges' decision. Singers gathered, and loudspeakers blasted their voices into the tent. Helicopters circled overhead, tilted on their sides so this or that royal family member could see the proceedings. Meanwhile, the cousins sat with matching nervous smiles, as though affected by some shared rictus. At last the announcement: Bin Tanaf. In a fit of exuberance the men of Bin Tanaf's family flung their headdresses into the air, shouted praises, and lifted their beaming sheikh onto their shoulders. Still unsatisfied, they climbed onto a marble table and lifted him higher; the whole pile came down when the table broke, projecting oranges, grapes, and men off the front of the grandstand. They regrouped on the ground below and danced a wild dance, swinging their camel crops overhead. In one sense Bin Tanaf's reward could easily be described in modern terms: an enormous long-haul truck, some cash, a trophy. But his true victory—a victory of maneuvers, and passion, and spies in the dark—spoke of something older and greater by far. The celebration back at Bin Tanaf's camp lasted all night. Two hundred Bedouin men sang, recited poetry, and told camel tales. Another group bashed their Land Cruisers into moonlit sand dunes at high speeds, spraying sand over a group of laughing children. Bin Tanaf and his eldest son, Mohamed, sat on the floor of an open tent, talking with friends around a communal platter heaped with rice and meat. The father's face burned with joy. "This is the best day of my life," he said. After a few minutes two men approached carrying another platter, this one bearing a distinctive yellowish hillock. "Ah," the son said. "The hump." That's the other thing camels provided during those long centuries in the desert. The much admired hump provided sustenance for the camel first, then later for its rider. So the camel's beauty is a practical one: A well-formed hump means nourishment. The slit-like nostrils can close tight against blown sand. Its spindly legs hold it aloft from the heat of the desert floor. The camel's wide, flat foot, with its two spread toes, may seem strange to outsiders. But the Bedouin see only heart-shaped footprints leading over the dunes of Arabia, and across the shifting sands of time.